DigitalNZ brings together more than 30 million items from institutions such as NZ On Screen so that they are easy to find and use. We added this one from this URL on 20 April, 2012, and last updated what we know about it on 20 March, 2019. This item is a video clip. It was created by an unknown creator on or around the date 2004. 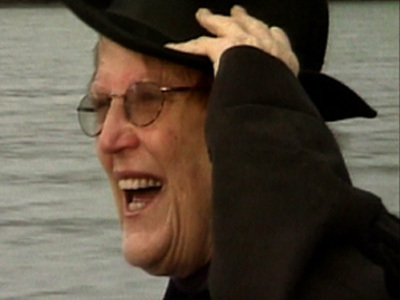 Made in New Zealand is a documentary about acclaimed New Zealand children and young adults writer Margaret Mahy. The film takes a line from her award-winning story The Changeover — "...made in New Zealand, it said, Wisdom Laboratories, Paraparaumu" — and uses it to talk about the importance of New Zealand settings in Mahy's work, her international successes, and her life as a writer. Mahy is filmed at her home in Governors Bay, speaking to children in her famous rainbow wig, and out and about on Akaroa Peninsula.